The beautiful community of Kahala is nestled between the Diamond Head State Monument and Wiliwilinui Ridge on the tropical south shore of Oahu. Popular for its white sand beaches and warm ocean water, tourists from across the world travel to visit Kahala’s shores. Home to some of the most extravagant homes in the state, this affluent community offers fun recreation and breathtaking views from every direction, which is what makes it a must-consider destination to home buyers across all demographics. Residents of Kahala enjoy every aspect of their community, from local amenities to an abundance of recreation, and many luxuries in between. With nearby adventures such as hiking Koko Head or snorkeling in Ke’ahamoe Bay, Kahala is the perfect destination for those who pursue and enjoy an active lifestyle. 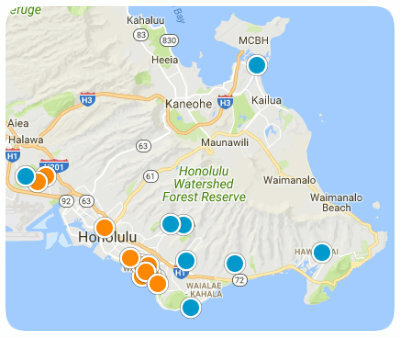 Centered around the Kahala Mall, there is never a necessity out of reach, with restaurants, shopping, theatres, and local businesses nearby. Additionally, the Wai’alae Beach Park and Country Club offer increased recreational opportunities, of which bring the community together through wholesome fun. The Kahala community is only a short drive from downtown Honolulu, where the Kalanianaole Highway leads to numerous restaurants, schools, churches, and other amenities that cater to all home buyer’s needs. With some of the finest homes on the island of Oahu, Kahala contains a large variety of luxurious estates, waterfront mansions, and beautiful homes with which home buyers will fall in love. Experience quality living at its finest in Kahala, with homes ranging from 1,500 to well over 8,000 square feet. Choose from a variety of locations, sizes, and styles to accommodate your personal living preferences. For those who desire more affordable options, townhomes and condominiums are also found in the Kahala community, with spacious floor plans, lists of amenities, and ocean views available. If you would like more information regarding homes for sale near Kahala, Honolulu, please allow us to assist you and contact us today.